Paula Boggs Band traverses jazz, bluegrass, blues and Americana. We released 2nd album "Carnival of Miracles," in March 2015. Our sound is "Seattle-Brewed Soulgrass," the band performs nationally, has appeared on TV, performs on radio live in-studio and is the subject of several radio interviews, podcasts, blogs and articles. We released a live acoustic EP in January 2017 and will release our 3rd studio album in June 2017. "Boggs makes...urban, jazzy music...nested within the structures of traditional folk, bluegrass, and even standard blues harmony...and she reminds me a little of Gil Scott-Heron, if only for the razor-intensity of her words." We are a 6-piece "Seattle-Brewed Soulgrass Band." Our sound is a fusion of folk/rock/bluegrass/soul/jazz and we use guitars, banjo, standup and electric bass, drums, accordion, all sorts of percussion, keyboards, trumpet and 3-part vocal harmony. We can play a large venue or do a very intimate show. We tell stories and love audience participation. We look like the UN and any crowd can tell we like each other as bandmates and friends. We are professional. We show up on time, always thank the sound engineer, waitstaff and bartenders. We love what we do. Starbucks vet Boggs and the 6-piece Paula Boggs Band traverse jazz, bluegrass, blues, rock and Americana. They released debut album "A Buddha State of Mind" in 2010 and "Carnival of Miracles," produced by Grammy-winning Trina Shoemaker in March 2015. 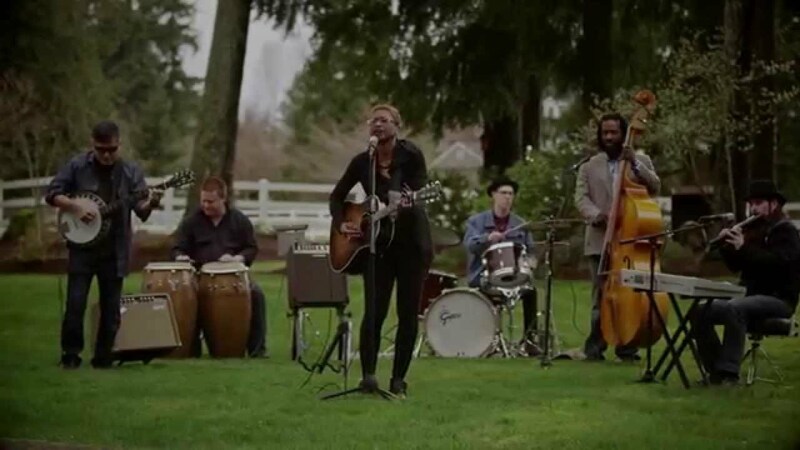 Their sound is "Seattle-Brewed Soulgrass," the band performs nationally, has appeared on TV, performs on radio live in-studio and is the subject of several radio interviews, podcasts, blogs and articles. The band released a live acoustic EP of consciousness songs in January and releases a 3rd studio album in September 2017. "[The] new cd from the Paula Boggs Band, Carnival of Miracles simply put [is] a masterpiece...here is a record with every song destined to be well known soon to audiences and equally loved. Congratulations to Paula Boggs and the Paula Boggs Band, they have hit this right out of the park." "Boggs makes a certain kind of urban, jazzy music that seems permanently nested within the structures of traditional folk, bluegrass, and even standard blues harmony...She calls her music “soulgrass,” and she reminds me a little of Gil Scott-Heron, if only for the razor-intensity of her words." Jefferson Airplane, Grateful Dead, Dave Matthews Band, Ben Harper, Calexico, Nina Simone, Gil Scott Heron, Willie Nelson, My Morning Jacket.